Acquired Book By: I was selected to review “Along the Way” by JKS Communications: A Literary Publicity Firm. JKS is the first publicity firm I started working with when I launched Jorie Loves A Story in August, 2013. I am honoured to continue to work with them now as a 3rd Year Book Blogger. I was originally contacted to review this novel last year  however, due to different reasons, I was never able to share my thoughts on behalf of this Luminis Books title until now. This is one of the books from my backlogue of reviews, I am thankful I can now set mind and heart to read. Luminis Books was one of the publishers I was most grateful to have discovered in  due to their compelling Children’s Literature. 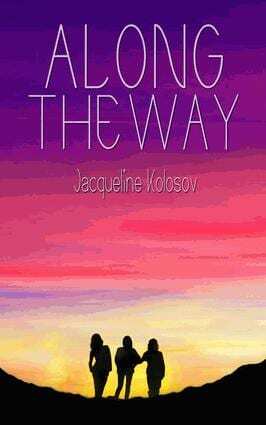 I received my complimentary copy of Along the Way from the publicist at JKS Communications in exchange for an honest review. I did not receive compensation for my opinions or thoughts shared herein. As “Along the Way” is reading to me to be a new book that paints a similar portrait of personal growth on a trail that re-defines your life by what you learn and what you gain by the experience itself. In a similar way, this is why I want to borrow the film “Wild” from my local library, as I read the review of a fellow book blogger I follow who gave me clarity of the story from her own ruminations but halted me from wanting to read it due to the heaviness of the abuse/neglect and acting out behaviour the author survived. The film thankfully glosses over some of it, but sometimes I find I can drink in a film better than a book. “Along the Way” feels more akin to “Not Without My Father” and a topical non-fiction I can handle rather than the harder hitting “Wild”. Three friends, 33 days, and 500 miles walking the Camino de Santiago add up to one journey they'll never forget. Piper Rose, Dani Shapiro, and Alexandra 'Tessa' Louise De Mille Morrow share a history that goes back to their preschool years in Chicago when their families were still intact. Now Piper lives in Evanston with her divorced dad, her estranged, unstable mother popping in and out of her life at random moments. Meanwhile, Dani's been living in Santa Fe with a psychologist mom pregnant with her fiancé's IVF babies. The blueblood Tessa resides on a prominent street in Boston and dreams of a romantic and well-heeled love story like that of her great-grandmother who went to France during World War II. Now that it's the summer before college, these radically different friends decide to celebrate their history and their future by walking the legendary pilgrimage along the Way of St. James, from the French Pyrenees to the Spanish city of Santiago. Along the way, each young woman must learn to believe in herself as well as in her friends, as their collective journey unfolds into the experience of a lifetime. Jacqueline Kolosov teaches creative writing and literature at Texas Tech University. She is the author of the young adult novels Grace from China, Red Queen's Daughter, and A Sweet Disorder, and the poetry collection Memory of Blue. She lives in Lubbock, Texas.